Here in Australia autumn has officially arrived, although, it does not feel like it yet as we are still enjoying bright blue sky’s, HOT days and fresh late summer produce. My parents have a mountain of figs coming off their tree’s so I have been putting them in everything, especially salads. 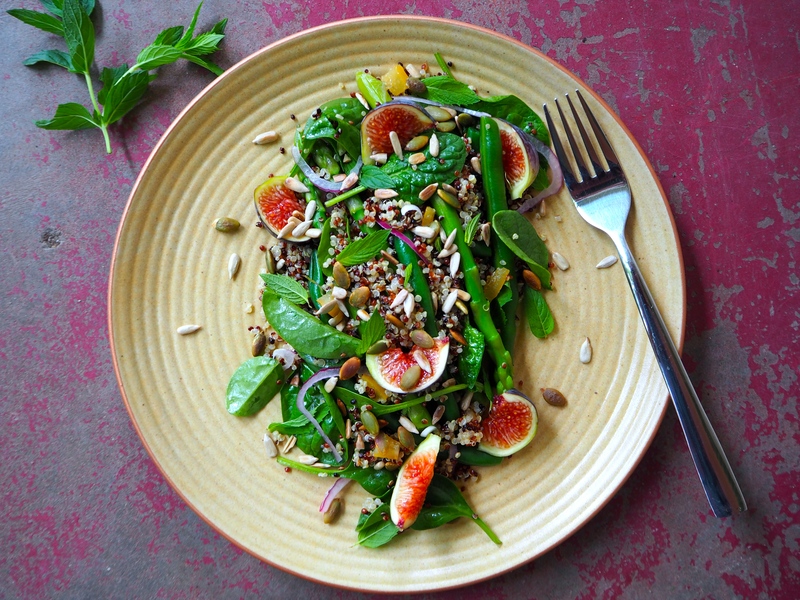 I love the contrast of flavours when adding sweet fruit to salads, it really adds another dimension. I have also snuck a little preserved lemon in here, which gives a beautiful mediterranean flavour. This is the perfect salad to have on its own, take to a friend’s barbecue or pack up for a weekday lunch at work. Firstly, rinse the quinoa thoroughly. Place in a saucepan with the bay leaf and 1 1/2 C of water. Bring the the boil, cover and turn to low to cook for 15 minutes. Once cooked remove the lid and fluff with a fork.Place into your salad bowl. Meanwhile bring another saucepan filled with water to the boil and blanch the asparagus and then the beans until just cooked. After removing from the water refresh under cool water. Put aside. Finely chop the preserved lemon and stir through the quinoa with the red onion. To make the dressing combine the extra virgin olive oil, lemon juice, salt and pepper in a small jar. Give a good shake and pour half through the quinoa. In a dry pan toast the sunflower seeds and pepitas until crunchy. Now, assemble! 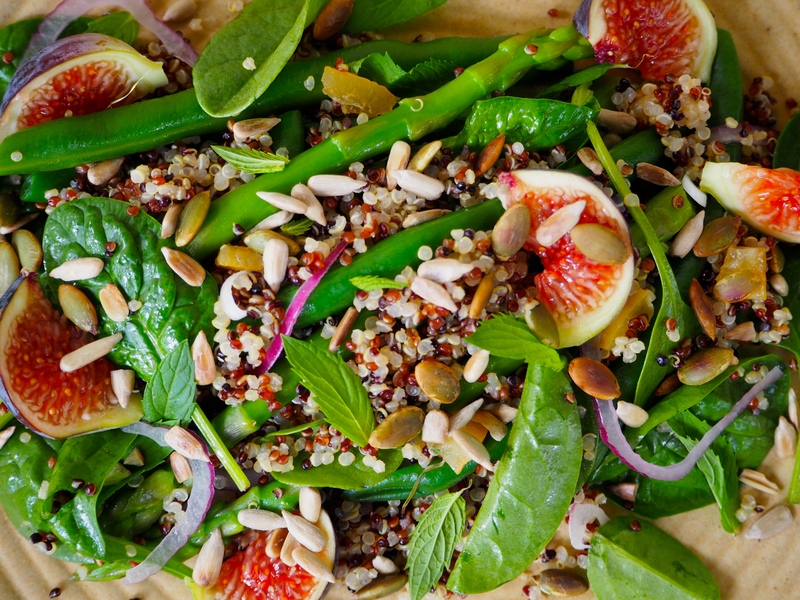 Firstly toss the green beans, asparagus, spinach and mint through the quinoa. 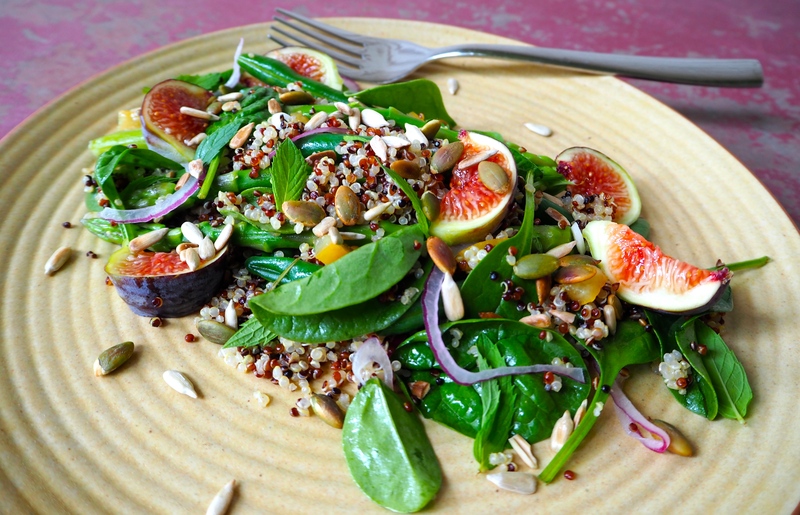 Place the figs on top, drizzle over the dressing and sprinkle on the seeds. Enjoy the flavours of late summer! That is definitely a beautiful and vibrant salad! Quinoa isn’t my favorite, but any grain or even lentils or little pasta could be substituted. Love those figs! I’m jealous – wish fall was starting where I live!